There is a new and improved version of the popular Herbalizer desktop vaporizer now available, and there have been some notable improvements. The original model popularly came with the choice to vape with either the balloon method or using a whip, and now the Herbalizer will also provide you the choice to use a glass attachment for vape hits that are the opposite of harsh. The glass attachment, known as a steamroller, is sold separately, but is worth the extra cash in the eyes of many users. You can vape your favorite dry herbs in ‘vapor-therapy’ mode, or even use the device for aromatherapy purposes. The Herbalizer desktop vaporizer can reach highly impressive temperature of 229 degrees Celsius, and there is absolutely zero combustion involved. This achievement in vaping excellence is unparalleled. This device looks almost like a space egg according to some users, which is appropriate since former NASA engineers designed it. 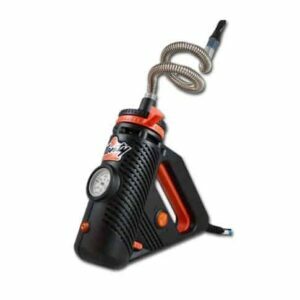 The Herbalizer is unmatched when it comes to the quality of your vapor, as well as the comfort and ease of use. The unit also comes with a nifty little stash compartment that is hidden from the outside, a high quality light bulb made from halogen internally, and it gives you four options of exactly how you’d like to vape. Using the balloon bag with the Herbalizer is about as straightforward and easy as you can get. Just squeeze the balloon’s valve, connect it to the device itself, and fill up the balloon with high-quality, pure-tasting and delicious vapor thanks to the powerful inside fan of the device. We recommend you discard old balloons after about two months of usage and swap in a new one. The Herbalizer starter kit comes with 3 replacement balloons, and more can be purchased separately if need be. Vaping with the whip option using your Herbalizer might even be simpler than the balloon, if that’s possible. The whip is made from silicon that is medical grade, and the fact that it’s integrated into the device sets the unit apart from lower quality desktop vapes. Few desktop vapes can offer whips that are a part of the device itself, but the Herbalizer’s whip is a part of the unit, being stored in a convenient space that is around the heating chamber. This clever design protects the whip when you’re not using it. As if all of the other innovative options weren’t enough, the Herbalizer can now be used with a steamroller made from glass attachment that is sold separately. When vaping with the steamroller, the path your vapor will travel down will be all glass. This of course improves the taste and smoothness of your vapes dramatically from using just about any other vapor path. Sometimes with other types of vapor paths, you’ll experience the taste of plastic or something along with your herbs. This not the case with the steamroller, as the attachment will give you the most pure, cleanest desktop vaporizer rips you’ll find. This mode is perfect for those interested in holistic healing, mediation, yoga, and so on. If you decide to use Freestyle mode with your Herbalizer desktop vaporizer, you are getting some of the highest quality aromatherapy possible. The Herbalizer is compatible with essential oils and you can set your aromatherapy timer for as long as you want. This simply ain’t your mother’s potpourri. 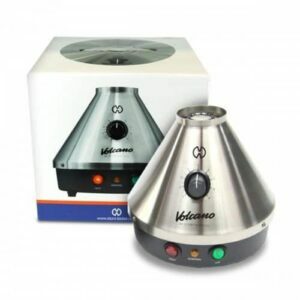 Along with its other impressive options, the Herbalizer brings along with it a new kind of aromatherapy that the manufacturers call vaportherapy. Vaportherapy looks to shake up the aromatherapy game by improving the therapeutic and relaxation benefits that come with vaportherapy. The heat settings are precise; regardless of whatever mood you are in – ranging from 143 to 229 degrees Celsius. Once you know exactly what temperatures are best for your vaportherapy sessions, you’ll be able to repeat the relaxation and calming effects again and again, any time you wish. With the Herbalizer, there is no need for an additional stash box. The Herbalizer space egg is all you need! The device features a storage container that is discreet and fits entirely inside of the vape when not in use. You can use it to store your dry herbs, your essential oils, your extracts and much more. The versatility and out of the box flexibility from the Herbalizer are simply unmatched. Even the newest of newbies have no problems when using the Herbalizer. One of the main reasons it’s so simple to use is because it features a touch screen that is powered by attractive and colorful looking LCD’s. Simply touch the screen to choose whether you want aromatherapy or vaportherapy, and pick your preferred temperature. You can toggle between temperatures in degrees Fahrenheit or Celsius at your preference. The Herbalizer’s advanced temperature system uses a processor that is housed internally within the unit, keeping tabs on how hot the 300w bulb made from halogen gets on the inside. The device will also remember whatever temperature you used it at during your last session, powering up to that exact point – which is perfect for those who know right where they prefer to vape. Another area that sets the Herbalizer desktop vaporizer apart from other models of its kind is the fact that it’s got advanced internal processors that preserve materials and prevent mishaps. The Herbalizer’s microprocessor will adjust the temperature of the lamp automatically, the second it detects any deviations from your desired temperature. In addition, the Herbalizer will automatically shut off if it detects that it’s about to be knocked over. The device powers down, but remembers the temperature you had it set at and nothing falls out because of the magnetically sealed nature of the heating chamber. This is extremely handy for those long sessions with big groups of friends that might lead to an accident or two. The precision temperature control, advanced features, intuitive processors and extensive vaping options of the Herbalizer really can’t be found elsewhere.